What Surprising Outdoor Plants are Native to the Dallas Area? CGreens uses a variety of ways to hold soil and keep it from washing away. Installing a retaining wall is an option that would be appropriate. There are many types of materials we use for the wall, from railroad ties, landscape timbers, concrete stones that look reasonably natural to many varieties and colors of native stone, which would be a beautiful addition to a landscape. Of course, plant material such as ground cover or grass is excellent as an erosion control mechanism if you have the correct amount of sun and water. You may have a temporary need during construction that we can help with by utilizing special cloths explicitly designed for erosion control. Re-grading your landscape to create a proper slope for runoff water and installing foundation protections such as wall sealant. Adding a root barrier is also an option to help keep trees and large plant life from drawing moisture away from the soil which leads to erosion near the foundation of your home. An Installation of a Sump Pump or Pits would be done by CGreens in situations where there is not enough slope to discharge to a Surface Drain. Also, French Drains are typically deeper and will need a pump to discharge water up and out to an area away from the collection points. The pumps that we install are commercial grade and can pump debris up to 1 ½” in diameter. We install check valves, unions, and alarms when necessary. Installation of surface drains, which are catch basin with a grate over the top of them at ground level, allows surface water to flow into them. When installing this system, CGreens makes sure to use a solid pipe that runs to a lower area to discharge, such as the street or storm drains. CGreens installs French Drains to collect subsurface water, not surface water! 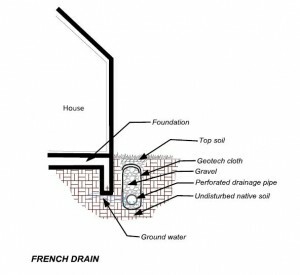 French Drains are a trench in the ground, lined with a GeoTech cloth that allows water but not soil to penetrate. A solid PVC pipe that has holes is placed at 5 & 7 O’Clock positions, then the trench is filled with gravel, and the cloth is folded over at ground level. Creating this hole creates a barrier to stop water and serve as protection and a sponge to draw water away from an area that needs to be kept dry. 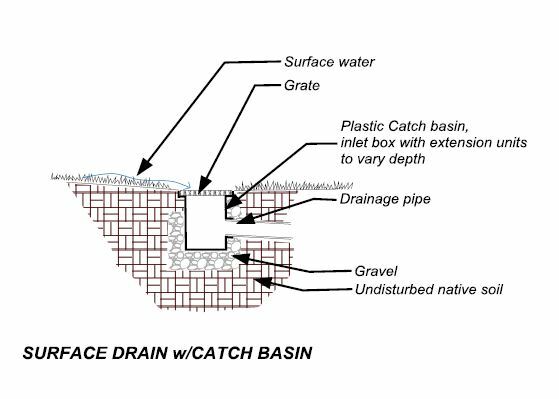 When we install a French Drain to prevent water from penetrating under a pier and beam foundation, the drain will be at least 6 inches below the perimeter beam. Special note* CGreens uses only SDR 35 solid, smooth bore PVC pipe. It is the same thickness as Schedule 40 pipe but is not used for pressure. Heck, you can almost drive over it! We do NOT use the black, flexible ADS rolls of pipe as it will crush very easy even when backfilling the trench! CGreens uses grates to catch water, and our filter systems can minimize the quantity of debris entering the system. For some grating projects, A foundation engineer may be the unbiased professional that you need. We have worked with many engineers since 1980 and can be your guide for a strong voice & properly graded yard and foundation. You need an effective system for removing stormwater and draining water before it can cause further damage. We are experts at all kinds of yard drainage systems that can move water from your property quickly and effectively. At CGreens we can customize water drainage systems for every landscape and situation that are designed specifically to fit your landscape. We offer systems for surface water drainage, subsurface water drainage, and water retention/holding containers.